WHO conducted a 4-day training for key national paediatricians and health care trainers on paediatric hospital care with special focus on triage and emergency assessment. 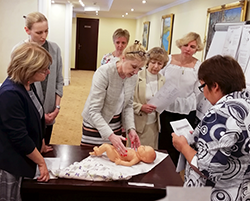 The training, held in Minsk on 25–28 June 2018, is part of a 2-year plan for cooperation between WHO/Europe and the Ministry of Health for 2018–2019 and included practical sessions, as well as an in-depth introduction to the WHO Hospital Care for Children mobile app. The recently launched Russian version of the mobile app provides guidelines for the management of common childhood illnesses, including the calculation of dosages and recommendations for preventive measures. It is available for download and is used by specialists in the field. The training also included practical sessions focusing on triage and emergencies and common childhood conditions, which were held at the Minsk Children’s Infectious Diseases Hospital. The event followed a review conducted by WHO in September 2017 to assess the quality of hospital care for children in Belarus. By the end of the year, specialists of the Ministry of Health with the support of WHO expertise are to revise the existing clinical protocols on emergency care of children and management of childhood illnesses, focusing on the introduction of triage and emergency assessment, in accordance with the latest international recommendations.